Running Through the Passage: An Arthritis "Flare up"...what the heck is that? An Arthritis "Flare up"...what the heck is that? These past few months have been such an education in arthritis. I had no appreciation for those that cope well with arthritis and how severely it can affect a person. I also learned I've had arthritis in my little finger for years and just didn't know that's what it was! So, in case you don't already know, people with arthritis can have no pain, a little pain, chronic pain or what they call "flare ups." A flare up is when you're having low to no pain for a while, a few days, or weeks, and then BAM! You feel like crap. It might be caused by stress, diet, lack of sleep, pushing yourself too hard or just the freakin' weather, but it happens. For me, my knee will feel like it's filled with broken glass. I can see why people with more active jobs than mine, have 1 in 5 odds of stopping work completely within 5 years after an OA diagnosis. It truly is a struggle to get out of bed and go to work when your knee hurts that badly. At the moment, running, even a short distance, feels like I'm half pulling my "bad" leg with me. It doesn't cause me stabbing pain per se, that feeling usually shows up at the end of a day or if I sit too long, its like the muscles just don't want to fire and my leg gets tired faster than the other. My "good" leg is sore because mechanically it does more of the work to compensate for the other leg now. My right calf muscle is notoriously sore after every run now, something I haven't experienced since I started running regularly 7+ years ago. So I'm starting to strengthen my right calf muscle more now (Lots of calf raises! lol)and really focusing on rolling out with my foot so I don't land with my weight on the inside of my knee. It's a process, and I'm working through it one run at a time. So what do you do? 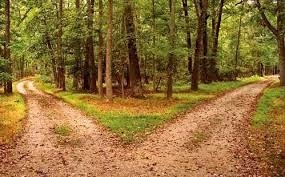 I see two choices, a fork in the road of life, so to speak. I can forget running, take up easier exercise and try to find happiness in that...OR I can continue to struggle and see what kind of gains I can make. I can see now that my running won't last forever, that pain might very well eventually cause me to reduce what I run or stop me altogether, but today is not that day and I am not a quitter. I will continue the struggle, cope however I can and move forward. Standing still is not an option.